This entry was posted in creative, Fragrance Oils, fun fragrance oils, homemade, Natures Garden Fragrance Oils, Natures Garden News, wholesale craft supplies, wholesale fragrance oils and tagged body safe fragrance oils, candle fragrance oil, candlemaking supplies, childhood wholesale fragrance oils, natures garden all over the world, natures garden candle supplies, soap making supplies on November 5, 2012 by Deborah Ward. Natures Garden has a vast company history dating back some 20 years. However, it is a little known fact that this year’s 2012 Favorite Fragrance Supplier of the year, was not the same business at its conception. In the early 1990’s, looking to help make ends meet for her family, Deborah Ward, ventured into the candle making realm of crafting. Starting as a newbie herself, Deborah was on a quest to find out everything that she could about her new undertaking. As I am sure you have already figured out, this wasn’t a very internet savvy time, so it turned into quite a task at hand. Finding very little information available, her next option was to learn through experience. Turning their quaint Elyria, Ohio home into a candle production area, Deborah and her husband Mike, through trial and error started producing candles. Once they felt they had the method mastered, Natures Garden candles hit the market. In 1997, through word of mouth, the business really started to take off. With all of this new found popularity, Natures Garden hired more than 40 independent sales representatives. Natures Garden generated revenue by means of home parties, retail sales, wholesale sales, open houses, and fundraisers. With success on the rise, frustration began to ensue as Natures Garden grew. Certain deficiencies appeared in the supply chain and there was a lack of uniqueness in the market. Mike and Deborah often felt that some of their suppliers fell short in providing the supportive relationship they were looking for. Then, due to the secrecy of the handcrafted market in both candles and toiletries, it seemed as if even more obstacles were preventing Natures Garden from truly expanding its product line. Figuring there had be other crafters seeking a positive relationship with their own suppliers, Mike and Deborah decided that there needed to be a candle and toiletry supplier that would help its customers succeed. The company had to have a foundation based on solving the three problems they noticed: poor customer service, lack of available information, and product uniqueness. By May of 1999, Natures Garden Candle Supply Company was official and its customer service and available industry information were turning heads in the industry. Providing the market with knowledge and great customer service was a feat in itself. However, Mike and Deborah did not stop there. Really looking to offer a new kind of company, Natures Garden focused its sights on being different. Thus, the NG Original Fragrances were born. These fragrance oils were not only one-of-a-kind, but they also were of high quality, and were available at very competitive prices. Unique became the name of their game. Today, housing almost 800 different fragrance oils, and thousands of various cosmetic, candle, and toiletry supplies; Natures Garden’s perfumists and staff work very diligently to keep those same values that the company was founded on. Now shipping worldwide, Natures Garden has business relationships with over 100,000 customers strong. 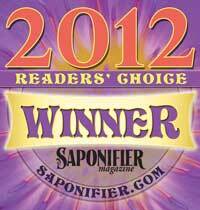 In the November 2012 issue of Saponifier the Magazine, Natures Garden was awarded the 2012 Favorite Fragrance Supplier of the Year. This yearly Raves for Faves contest asks all crafters from hobbyist to owners to vote for their favorite suppliers. Ballots are counted, and all winners are then announced in one of the magazines publications. We would now like to truly thank all of our wonderfully creative customers. It goes without saying that helping you succeed is what drives our passion in producing strong, unique, and fun fragrance oils. For without all of you, your love, acceptance, and loyalty as returning customers, Natures Garden would not exist. A special thank you also needs to go out to any of our amazing customers that took time out of their busy schedules to vote for Natures Garden as one of their favorite suppliers. We really do appreciate all of the positive and kind words cast about us. So, in honor of the 2012 Raves for Faves, Natures Garden would also like to announce that we too have counted our ballots and by a massive landslide Natures Garden’s customers were voted this year’s Favorite Customers Ever! Congratulations to all of you! It is through all of your hard work, creative genius, and go getting attitudes that you were selected as our clear winner over everyone else. This entry was posted in cold process soap, make your own soap, soap making recipes, soap recipes and tagged body safe fragrance oils, handmade soap, handmade soap recipes, homemade soap, homemade soap recipe, how to make cold process soap, how to make your own soap, make soap, make your own soap, making your own soap, making your own soap recipes, natural soap, natural soap recipes, natures garden wellington ohio, organic soap, organic soap recipes, soap fragrance oil, soap making, soap making supplies, soap recipes, wholesale fragrance oils on November 2, 2012 by Deborah Ward. As a newbie, it may be difficult to figure out your soaping recipe, especially if you do not have a starting point. Or, maybe you are a veteran that is just looking to expand your recipes, catering to new cliental with special skin needs. Well, we at Natures Garden want to help you produce the best soap bars on the market. Whether for personal use or for selling, let’s talk recipes! After you have decided which method of soaping you are going to choose, the next step will be determining the purpose of your soap bars. Soap bars have 5 distinct qualities that you are looking to have a nice range or balance in. They are: Hardness, Conditioning, Cleansing, Bubbly Lather, and Creamy Lather. Additives such as fragrance (scent) and color (or appearance) of bars should also be considered when trying to determine a soap recipe. After you have a good idea as to what type of soap bar you would like to achieve, it is time to configure a recipe. There are various soaping calculators available on the internet; however, SoapCalc provides a FREE, comprehensive, easy to use soaping calculator. Not only is it known as one of the best, but this site is also improved and updated frequently. Now, remember that it is imperative that all the correct information is given to calculate the proper saponification totals needed. Once you are on the SoapCalc website, you will enter various items. Starting from left and proceeding to the right, the first information needed is the type of lye. If you are making bar soaps, you will need to ensure that the NaOH button is selected. If you are making liquid soaps, you will need to ensure that the KOH button is selected. Yea, the first step is done. The next step is to calculate the weight of oils. These will be based on the weight solely of the oils; do not include water or lye into this total. You will have to select the button in pounds, ounces, or grams. Our suggestion is that it is easiest to use ounces for this category. However, regardless of which weight unit you select all 3 (pounds, ounces, and grams) will be presented on your printable recipe. As a rule of thumb, using 16oz of soaping oils will produce about 20 oz of soap. This however, may vary. It is completely dependent on the types of oils used, any additional additives, and the amount of water used. We have found that 48 ounces of soaping oils typically create 4 pounds of finished bar soap; allowing you to fill all 4 loaf molds in our 4 Loaf Silicone Mold. For the third section of the soaping calculator, you will be entering the water. This can be a little confusing. If you are a beginner, it is best if you select the water as % of oils button. This automatically fills in a default of 38%. This number can be changed, but if you are new, this is a standard suggested by the soap calculator. Once you have accomplished making your first few batches of soap, you may want to start to decrease this percentage little by little until about 33%. For the advanced soaper and those with soaping experience you also have the option of entering a lye concentration percentage or an option for entering a water to lye ratio. The next section is the super fat and fragrance. If you recall from the earlier soap making blogs, a super fat pertains to the amount of soaping oils that is unsaponified by the lye. This could also be considered the surplus of oils. Since the soaping calculator provides your calculated recipe, you may want to deliberately leave a certain percentage of your soaping oils in your bars of soap. SoapCalc automatically has a default of 5%, but this can be changed. Some soapers choose to do this to add certain skin benefits such as creaminess or conditioning to their finished products. However, be careful not to over super fat your soaps. While saponified oils in soap typically do not become rancid, the extra oils in your soap that were not saponified can overtime become rancid; producing the Dreaded Orange Spots. As for the fragrance per pound section, it is not mandatory to enter something here. If you do not plan on adding any fragrance to your recipe, the soap calculator will still produce your recipe. However, if you do plan on adding a body safe fragrance oil to your soap recipe, you will want to add the weight of the fragrance oil per pound of soap. A general starting point is .8 oz per lb, or 50 gm per kg. Also, before using a fragrance oil in soap, make sure that the fragrance oil was formulated for soap making, and check its IFRA maximum safe usage percentage (category #9). At Natures Garden, we like our soap very fragrant, so if IFRA allows for it, we use 1 oz. fragrance per pound of soap in our recipes. For the next section of the soaping calculator you will be selecting your soaping oils. There is a list provided of common soaping oils used. By double clicking on the specific oil that you would like or by clicking the oil once (to where it is highlighted) and then clicking on the plus sign (to the right of the list of oils), you will notice two things. First, the oil name will appear in the next section, Section 6; as well as numbers will appear under the soap qualities and fatty acids box. Each time you select a new oil to your recipe, the soap quality and fatty acid numbers will change. This is a great section to review the soaping qualities of certain oils, as well as explore possibly adding some new oils to your recipe. A quick tip: by placing your icon over the soaping qualities listed in section 5, a green box will appear with a general range guideline. This is for reference only. Once you feel comfortable with your soap making skills, you may want to go above or below the ranges. Other important information that is provided with each oil that you select is the SAP value. This is the amount of lye that is required to saponify that specific oil. The values will be located directly below the list of commonly used soaping oils. The Iodine value of each soaping oil selected will also appear. It is located directly under the 5 soaping qualities. This number is a general gauge for the hardness of the soap bar supplied by that oil. Always remember: the lower the Iodine number, the harder your bars will be. The final number that you need to acknowledge is the INS value. This value is decided based on the Iodine value and the SAP value. The optimal number here is 160 for your total recipe oils value. Although it is not yet concrete, studies have been conducted to show that reaching the ideal INS of 160 in soaping recipes, improves trace, gel phase, and total saponification time. If at any time you accidently select the wrong soaping oil, or change your mind on which oils you will be using, there are plus and minus signs to the left of the listed oils in section 6. By simply clicking the minus sign, the soaping oil that you had selected will now be removed. Once you have all of the soaping oils you would like included in your recipe listed in section 6, the final step in this section is to add the amounts. You can do this in two ways. The first is by percentage. You do this by clicking the circle above the symbol %. Please note the total amount of weight for your soaping oils must equal 100%. The actual weight based on the percent of the oil that you would like to use will be calculated for you once you view your recipe, but let’s not get too far ahead. The other possible way to enter your amounts of oils is by clicking the weight button. This will either say lb (pound), oz (ounce), or gm (gram), depending on which weight unit you selected in section 2- weight of oils. In the seventh section of the soaping calculator, you will click the calculate recipe button. Once this button is selected, the soaping calculator fills in information about your total recipe. If there is anything off with the recipe, an alert will appear on your screen. An example of one of these messages would be if your recipe contains a high lye to water percentage. Usually, a percentage of 40 or higher is considered not safe, but the soaping calculator will still present your recipe. The soaping calculator will also provide you with a solution and an explanation as to why there may be issues with your recipe. Once any problems are acknowledged or solved, it is time to take a look at what characteristics your soap recipe provides. There are 3 categories that you will want to review: the soap bar qualities, the percentages of fatty acid, and the ratio of saturated to unsaturated fats. If you are a newbie: Remember, you may want to reference your ranges for qualities on a nice balanced bar of soap, making sure you have oils that accommodate nicely among all 5 of the distinct soaping qualities. If you are unhappy with your recipes results, modifications can be made until you are. It is as simple as correcting the area you are not happy with and selecting the calculate recipe button until your results are where you want them to be. When you are ready to print your recipe, simply select the View/Print Recipe button. This button will become active after the calculate button has been selected. The recipe will be viewed in two ways. You will either have a new window pop up, or a new tab appear. This will show you the recipe with amounts, plus give you some other useful information where you can reference the total soaping qualities of the recipe. If you would like to compare several recipes against one another, you will want to click the multiple tabs button next to the view/print recipe button. This will allow you to either have multiple screens or tabs to compare with ease before you print. Now let’s take a quick look at the information that the printable recipe page provides. The top portion (blue boxes) of the page provides a quick look summary of your recipes parameters. The next section (pink boxes) references the required amount of lye and water that is necessary for your recipe. This section’s information is provided in pounds, ounces, and grams. The soaping oils section (green boxes) also is provided in pounds, ounces, and grams. The soaping qualities range is provided in the next section (yellow boxes). Your recipes total is configured right next to the range, as is the fatty acid profile of your recipe. When you are ready to print, select the print recipe button. There is one button in the top right corner, and there is a second print button in the bottom right corner as well. And, that it is. Don’t be afraid to get out there and explore with all of your new found soaping information. Visit Natures Garden’s website for soap making supplies!